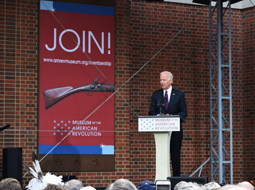 Last week, on the 242nd anniversary of the “shot heard ‘round the world,” I was delighted to join with distinguished guests and the general public for the grand opening celebrations of the Museum of the American Revolution in Philadelphia, Pennsylvania. The museum has been many years in the making and DAR was pleased to support its efforts along the way. The festivities began in the morning at Washington Square Park for a reflective and reverential tribute at the Tomb of the Unknown Solider of the American Revolution. 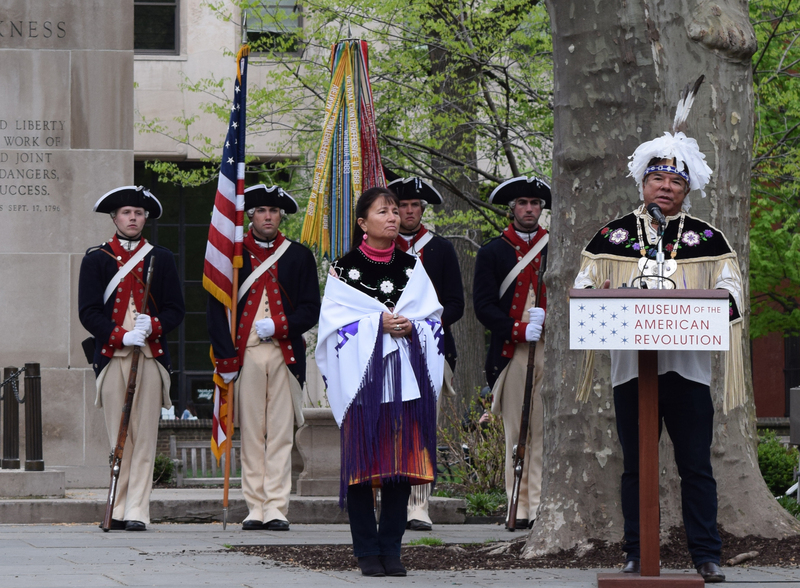 After a performance by the 3rd US Infantry Regiment Fife and Drum Corps, Michael C. Quinn, President and CEO of the Museum of the American Revolution, along with Cynthia MacLeod, Superintendent of Independence National Historic Park, welcomed those gathered. General John P. Jumper, Chairman of the Museum of the American Revolution, placed a wreath at the Tomb of the Unknown Soldier. Joining us at the Square were historically outfitted regiments from each of the original 13 colonies. Following the service everyone processed in a grand parade down 6th Street to Independence Hall. The ceremony in front of Independence Hall included remarks from the Governor of Pennsylvania as well as Governors, or their representatives, of each of the 13 colonies. Each had a chance to proclaim their state’s greatest contribution to the Revolution followed by a rousing “Huzzah” from those of us in the audience. The procession then continued a few blocks more on Chestnut Street to the Museum of the American Revolution. At the Opening Ceremony, we sat on the plaza in front of the new Museum and soaked in the beautiful spring sun. The ceremony included remarks by David McCullough and Cokie Roberts among others. We were treated to a musical performance by Sydney James Harcourt from the original cast of the Broadway musical Hamilton, who was accompanied by the extremely talented students from the Philadelphia High School for the Creative and Performing Arts. Former Vice President Joe Biden delivered the keynote remarks prior to the official dedication and ribbon cutting. You can watch a video of the Opening Ceremony on C-SPAN American History TV here. Prior to touring the Museum I had the pleasure of meeting Pennsylvania and New Jersey Daughters who were equally as enthused as I was to tour the Museum. I also had a chance to visit with the Museum of the American Revolution President and CEO, Michael Quinn, who very kindly asserted that if not for the dedication of the Daughters of the American Revolution carrying the torch for the past 125 years we might not have gotten to this exciting day celebrating the history and spirit of the American Revolution. He expressed his anticipation of being with us at Continental Congress and telling members more about the Museum during his presentation at Service to America Night on Friday, June 30. Walking into the Museum and approaching the grand staircase leading to the galleries, I was struck with awe seeing the large Siege of Yorktown painting at the top of the stairs. 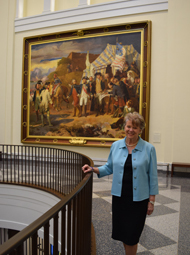 I appreciate the support the DAR gave to the creation of this Museum and our sponsorship of the conservation and installation of this magnificent painting. I hope that you all are as touched as I was by the prominent recognition of the National Society, by the location of this art in the main atrium of the Museum. Prior to going upstairs, visitors begin their museum visit with a beautifully done film that explores the origins, experience and ongoing legacy of the American Revolution. Upstairs, before entering the galleries, visitors watch an immersive film that follows General Washington’s remarkable journey and then reveals his original Revolutionary War headquarters tent. 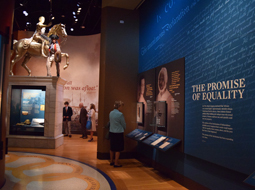 The Museum’s four main galleries explore the early days as the roots of the rebellion took hold; the darkest days as the fragmented colonies entered an uncertain war; the final years of the War for Independence from the many perspectives of the diverse people who lived through them; and then the immense task of creating a nation founded on the principles of life, liberty and the pursuit of happiness. The visually engaging exhibits have a rich collection of Revolutionary-era weapons, personal items, letters, diaries and works of art combined with immersive galleries, theater experiences and re-created historical environments. 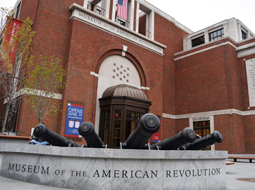 It was a wonderful experience being able to celebrate the opening of the Museum of the American Revolution with so many who are passionate about preserving the history of the Revolution as well as those who were possibly just beginning their journey of understanding more about the founding of our nation. It made me appreciate being able to claim membership in our great organization that has kept alive the memory and spirit of the American Independence for more than 125 years. Huzzah! #TBT 125 years ago, on April 19, 1894, the Sequoia Chapter in San Francisco, California, planted a �... 20 hours 36 min ago.